Sidney Slon/Staff Photographer The Elsie B. Rosefsky Memorial Art Gallery in the Fine Arts Building hosts artist Charles Matson Lume’s exhibition, “you can almost see (for Joyce Sutphen)” through Dec. 6. Last Thursday, the Elsie B. Rosefsky Memorial Art Gallery in the Fine Arts Building hosted artist Charles Matson Lume’s exhibition, “you can almost see (for Joyce Sutphen),” with a public reception featuring an hourlong talk with Lume. A visiting visual artist from Minnesota, Lume focuses on the ephemeral and the unique, shifting and often poetic relationship between light and matter. He explores themes such as time and transformation, asking questions on what it means to be present in the world. The inspiration for this collection is a poem titled “Naming the Stars” by poet Joyce Sutphen. After reading the poem aloud, Lume explained why it was dedicated to her. While reading through a number of her books last summer, Lume found this particular poem and it struck him deeply. While the collection’s purpose is not to illustrate the poem, it does use the lines to reflect on thoughtful themes. Lume often uses poetry as inspiration for his work. Lume began the artist talk with about 90 slides worth of pictures, many of which depicted his inspiration for art, and later, his influences and progression of the work itself. The concept and functionality of space related to sports, and the transient nature of music as seen by his wife, a musician, contributed to Lume’s broad platform of inspiration. Lume also suffered from a disease in his corneas for about 13 years, which, at times, severely affected his vision. One of the slides Lume included was a painting by Ad Reinhardt. At first glance, the painting looks like a square of pure black. When examined closely, however, one will notice the nuances of blue in the middle, forming a shape within. Lume explained his first encounter with this painting, which occurred in his mid-20s at New York’s Museum of Modern Art, and his understanding of the audience’s confusion about how to react to ambiguous works of art. After realizing the depth of the color, however, Lume said he remembers being blown away. Lume spoke about his journey into creating the displays, and his exploration of pairing objects and light with placement throughout graduate school. He began going through photographs of his own work, which invoke abstract concepts and play with space and material. Fleeting expressions and unconscious moments, even accidents, all play a part in the creative process. Some of the installations are immersive, while others are bits and pieces, such as the collection in the Rosefsky Gallery. One photograph depicted a display of a space filled with over 600 lights. The space was beautifully lit, but Lume drew attention to the 10 fruits laying in various locations on the ground. Photographs of other installations included magnifying glasses, tile spacers and the use of everyday items. Lume poses the question as to how debris can generate visual interest, and even spark potential deeper meaning. “How can the junk of our culture become something that’s engaging and powerful?” he asked. Pushing the boundaries of artistic limitations and finding the places you cannot go are both concepts behind Lume placing “no trespassing” tape on one of his pieces. A particularly striking piece using cellophane’s reaction to light explored the manifestation of shadow and light. “To me, that’s really profound, that the complexity of things can actually be simple,” Lume said. 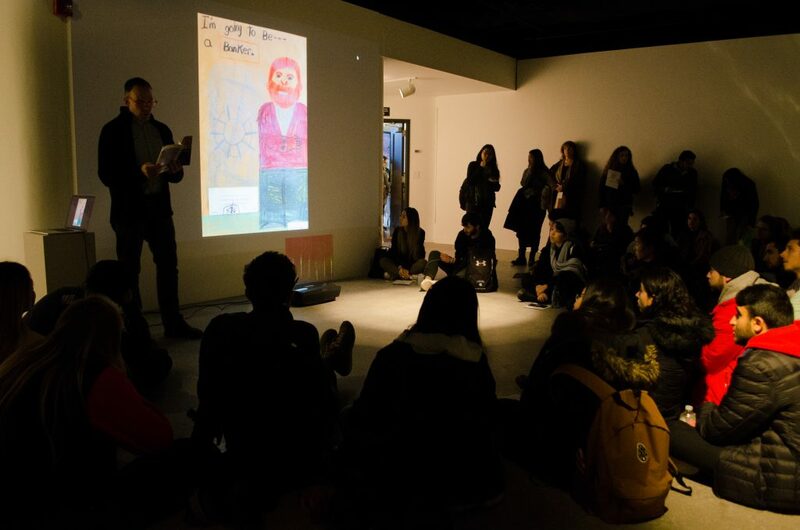 Students who attended the exhibition enjoyed the artist talk and agreed with a lot of the concepts Lume put forth. Lily Newland, a senior majoring in art and design, subscribed to the notion of ambiguity and allowing oneself to be fully immersed in the moment. Some who have gone to other exhibitions this semester continue to be impressed with the encouragement of artistic expression on campus. The presentation of the displays in the Rosefsky Gallery will change over the days, as they are influenced by the amount of light in the room. Contrast depends on the amount of light exposure at a given time. The uniqueness of its changing state may call for multiple visits. Lume’s work, overall, feels reflective and mysterious. Floating just out of reach, like many of the working themes, Lume feels that art can help us notice the thought-provoking instances throughout life. “I think we don’t have enough wonder in the world,” he said. The exhibition will be open until Dec. 6, and is open to the public.